Pre-Orders for SDCC Exclusives are Closed! All inventory allocated for pre-orders has been reserved. But there’s still hope! We will be reviewing all orders and in the event of duplicates or cancellations, we may have a small amount of inventory that becomes available for pre-order for pickup at our SDCC booth. To be notified by email in that event, please use the form located here at The NECA Store to let us know which product(s) you are interested in. 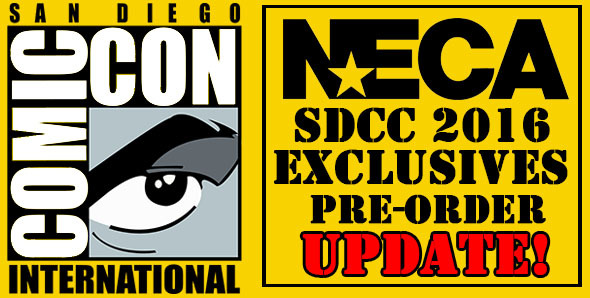 NOTE: Your email will only be used to notify you if more SDCC exclusives become available for pre-order, and will not be shared outside the company or sold. Can I still get them at the show? Yes. We will have a limited quantity available – for full details on how to buy at the show, visit the SDCC EXCLUSIVES FAQ. 2012 SDCC Exclusives Pt. 4: B&W Comic Book Freddy as seen in The Dream Child!